Family-0wned. Family-operated. Covers just about everything I like about small business. If you need help covering your commercial entryway or your home deck – consider Northwest Awning & Fabric. Scott did a great job with our site. We approached him not knowing anything about the website building process; he walked us through every step of the way. He helped us understand what we needed to know, and we can now manage and make changes to our site with confidence and ease. He was fairly priced and definitely went the extra mile to make sure we were happy. I’d strongly recommend his services. 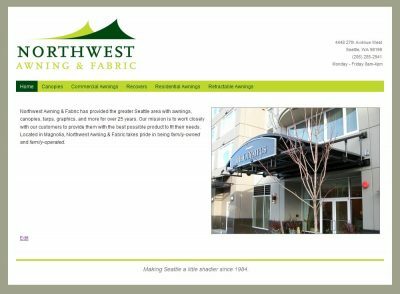 Northwest Awning & Fabric Inc. Thank you for doing such an amazing job. It was a pleasure to work with you!